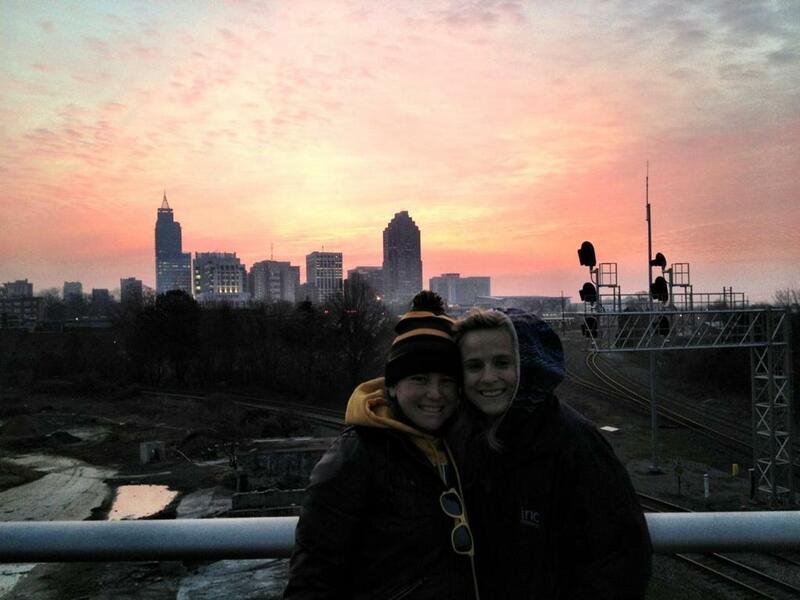 For two years of college, I played Division 1 field hockey. In April of 2008, my team was eliminated from the university due to severe budget cuts. Some of my teammates decided to transfer, I went abroad, and one of my teammates decided that she wanted to play rugby. The women’s rugby team was comprised of some of my closest friends in college and their toughness and dedication to the sport was contagious. After returning from abroad, I spent many of my weekends traveling to go watch their matches. I had become somewhat of a women’s rugby team groupie. But as much as I admired their toughness and dedication, each time they asked me if I’d join the team, I’d still respond with a tremendous no. And there was one reason why. When it comes to big–I mean BIG bruises,I’m a cryer. And if anyone knows the sport of rugby, they know that it’s not a sport you can get knocked down and cry in. Even though field hockey was also intense and a bit of a contact sport (when the ref turned her back), it didn’t intimidate me the same way that rugby did. Maybe it was that I had played field hockey for eight years and I understood the game–or maybe it was because each time I saw my rugby friends they had new bruises–new BIG bruises. Whatever it was, I had made a very firm decision in college not to join the rugby team even though I had more respect for my friends who played than anyone could imagine. So recently, when a member of the Two Rivers Roller Derby team from New Jersey/Pennsylvania reached out to me and offered me a chance to be an honorary member for a day, I froze. Roller Derby, like rugby, involves a lot of contact–A LOT of contact. The women and men who play roller derby are tough. They endure hip checks and shoulder checks; they take on big hits, and they risk getting thrown off their skates each second of play. Basically, like rugby, the sport doesn’t have room for cryers after a big hit. It only has room for the skaters who want to be there, who can handle getting knocked down, and who are ready to get hit again only seconds later. I hesitated before I responded to the member of the Two Rivers team and I started an internal dialogue with myself. “Libs…you can’t say no. It’s kind of your rule.” –“No, no but rules are meant to be broken.” — “Come on you know you secretly want to…” And before letting my other half respond with something negative, I typed an email out to the Two Rivers Derby girl saying I’d absolutely love to try roller derby, that it had been on my list for a while (it had been–in order to get over that fear of being intimidated by these contact sports), and that I would make it work with my schedule in New York City to make it back to Pennsylvania and test out the waters. Leading up to the roller derby experience, some of my friends in New York warned me to be careful, and my co-workers created a text code for if I broke any bones: “Text me 511 for a broken leg and 411 for a broken arm…” All the build up was making me itch with nervousness. Part of me really didn’t want to do it–but I’m not one to cancel. 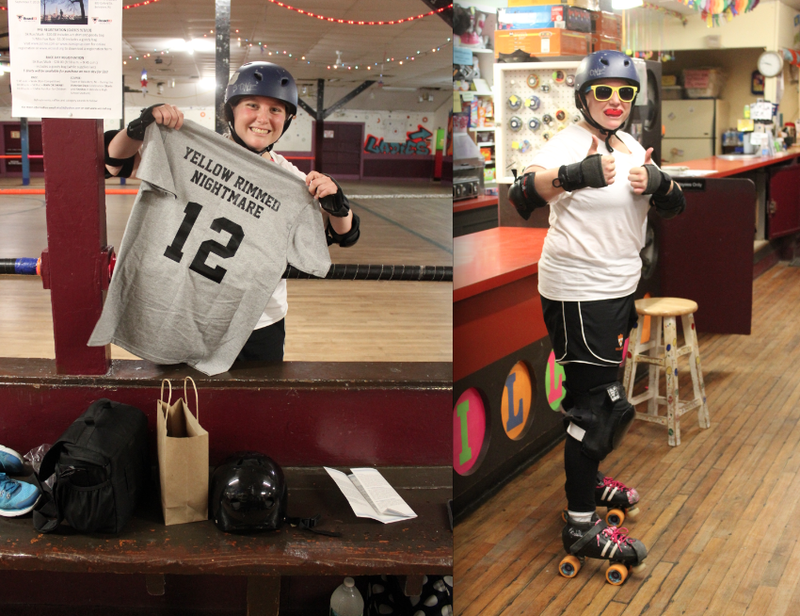 But less than two months after receiving my invite to come out and try the sport, I had picked out a roller derby name (The Yellow Rimmed Nightmare) and I was lacing up a pair of quads at a small-town roller rink on the border of New Jersey and Pennsylvania. As the team stepped into contact drills, I watched nervously chewing my mouth guard. One of the coaches asked two people to come out to form a block and one person to be a jammer. As this happened–I began to ask questions. “Block? Jammer” What do these words means???? 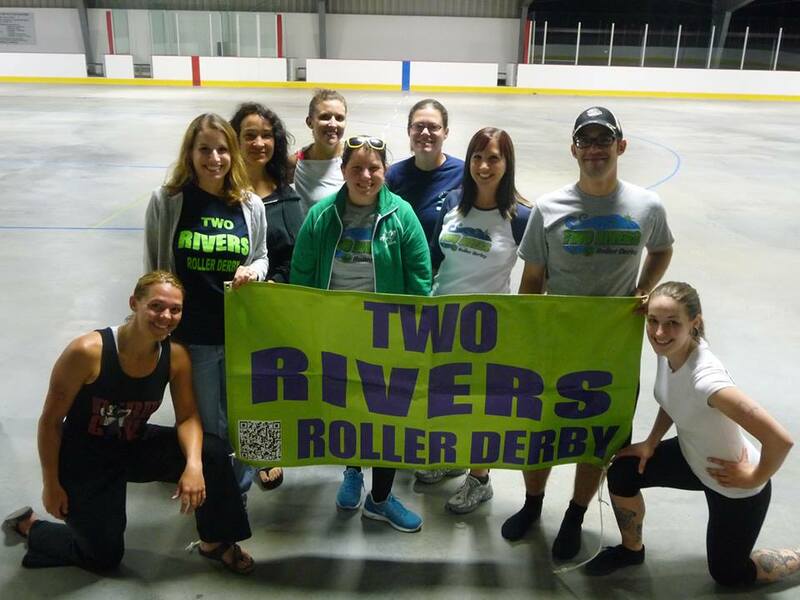 In roller derby, five people from each team are on the rink at a time. One person is called a jammer–He or she can score. Three people are blockers–and one is the pivot. (A pivot directs the blockers–guides the pack). 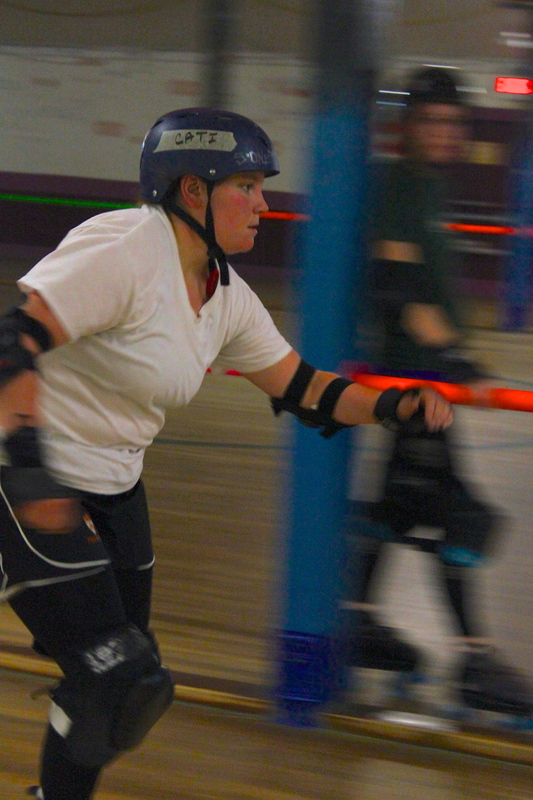 The jammer’s goal is to lap the blockers of the opposing team. You do this by breaking through their blocks, getting around, or jumping over them. You can’t elbow/push, but you can hip check/shoulder check etc. For each lap after the first initial breaking of the block–you get a point. There are two 30 minute halves in which the team plays a series of 2 minute rounds. After 2 minutes, there’s a 30 second break to sub players on or off: then you go 2 minutes again, until the half is over. I continued to bite my mouthguard. “You’ll be okay,” one of the girls called over to me. I managed to make it through the night of practice without falling and without bruises–and most importantly without shedding any tears. In fact, I ended up leaving that night wanting to play more–wanting to be back in the rink–or on a field playing any team sport. For a good amount of time since the field hockey team got cut in 2008, five years in fact, I’ve strayed pretty far from the team sport train. I’m not sure if it’s because it was too painful to lose the one sport I worked for, for most of my life at that point, or because I was ready to taste other adventures–but this felt good. It felt good to be skating circles around a rink with a constant push of positive reinforcement as I completed one lap after another during the endurance part of the evening. And it felt even better to give pounds and high fives when others did well, and it felt the best when I had the opportunity to cheer the women on the following night as they played hard in an open scrimmage. The truth is: we can spend our whole life being terrified of something that we haven’t given a chance–or we can have the courage to say we are going to do something–and then have even more courage to go out and do it–and then realize just how much we were missing all along. Posted in Fun and tagged adventure, babe ruthless, blockers, Bruises, Crying, fear, Field Hockey, fun, hip check, hitting, Hobbies, jammers, jamming, Life, me, Pain, pivot, roller derby, shoulder check, team sports, tears, the hobby hoarder, the yellow rimmed nightmare, two rivers roller derby, wall, whip it, winning, world. Bookmark the permalink. On this blog, I’ve written a lot about excitement, about fear, about risk, about joy, about happiness. But I haven’t written about sadness. 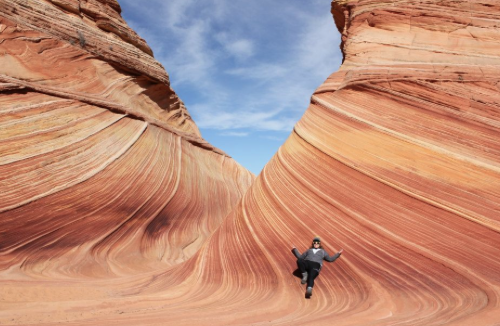 I guess it seems strange that I’d put down a post about “sadness” when writing about something as rewarding as a fifty-day cross country trip, but I promise, it will all make sense. Returning to New York City, from fifty days of continuous stimulating adventure was hard. Going from a fifty-day trip with rarely any sleep, back to the city that never sleeps suddenly felt like going on an exotic trip to a foreign country. As Kim drove me to my apartment, after dropping David off in mid-town Manhattan, I suddenly felt lost in my own home. And as I arrived back at my place, I felt even more lost. For a few days, I couldn’t eat, I couldn’t sleep, I couldn’t function. It wasn’t dissimilar to the feelings I had or the culture shock I went through when I returned to America from studying abroad in Italy back in 2008. That semester abroad had been my first real shot at exploring the world, and when I returned to the states–I was devastatingly depressed. I spoke in Italian to strangers, I imagined sprinting through Piazza Navona while I ran in the gym on a treadmill, and I day dreamed of going back and galavanting down the cobbled alley ways. It took me months to readjust. I didn’t want it to take that long back in New York. Suddenly I was more fearful of being in a place I recognized, or now seemingly didn’t, than I had been in the new novel nooks of the country that I had gotten to experience, and that was an overwhelmingly strange feeling. Now, the the routine of the train which I’ve written about enjoying in the past, suddenly felt like a nuisance. And don’t get me started on the feelings I had about interviewing for jobs and returning to work. I actually considered packing up a suitcase–renting a car–and driving off again. I asked someone if they often felt sadness when they returned “home” from traveling. Their response was that they had wondered how long it would take the sadness to kick in for me. I’d felt a large amount of sadness in my life before–but this sadness was different. It wasn’t a depressive sadness. It was it’s own breed of sadness–one that stems from all those other feelings I felt throughout the year: excitement, fear, joy, happinss. As I wiped away my tears, I wrote another text to another friend: I am okay with this sadness. Pooh’s right. It’s easy to forget how lucky we are sometimes, when sadness is all we feel. “How lucky I am to have had the chance to experience something so wonderful. How lucky I am that the sadness I feel now is because of an overwhelming feeling of joy that I was privileged to feel, that we can all be privileged to feel, if we just let it happen. How lucky I am that the sadness I feel now is because of the world I let myself see, the chances I let myself take. the obstacles I let myself face, the fears I let myself overcome, the challenges I let myself defeat. the life I let myself live. How lucky I am to look back on the moments I lived–with tear drops in my eyes and joy in my heart.” –-Again–I learned to respect the sadness. Over the days that the sadness had escalated, I told myself that I had to think of returning from the trip–not as an ending–but rather–a transition–but more so as a landing. So often, we get caught up on the words “ending” and “finale.” But there was nothing final about this trip–this hobby year. Both adventures opened up incredible opportunities for me to learn about myself, to challenge myself. Both adventures allowed me a chance to grow. Both opportunities allowed me to experience meet new people from all walks of life and to build long lasting friendships. Most of all both adventures allowed me to live a life I’ve always wanted to live: one that’s filled with genuine happiness. The flying lesson that I posted a video of on this piece may have been the final day of the travels, but to use that word “final,” just seems wrong. That last day gave me a chance to look back on not only the trip with two of my best friends, but also on the year that I said “yes” to–the year that allowed me to overcome my fears, to tackle things I never thought I could–the year that allowed me to live life in an abundantly, exciting way. The year that went from a project–to a lifestyle. The year that was my navigation to true happiness. That my friends is not an ending. That my friends is much bigger than an ending–and much more rewarding. That my friends, is what I call a landing. And what’s the best part about landing? 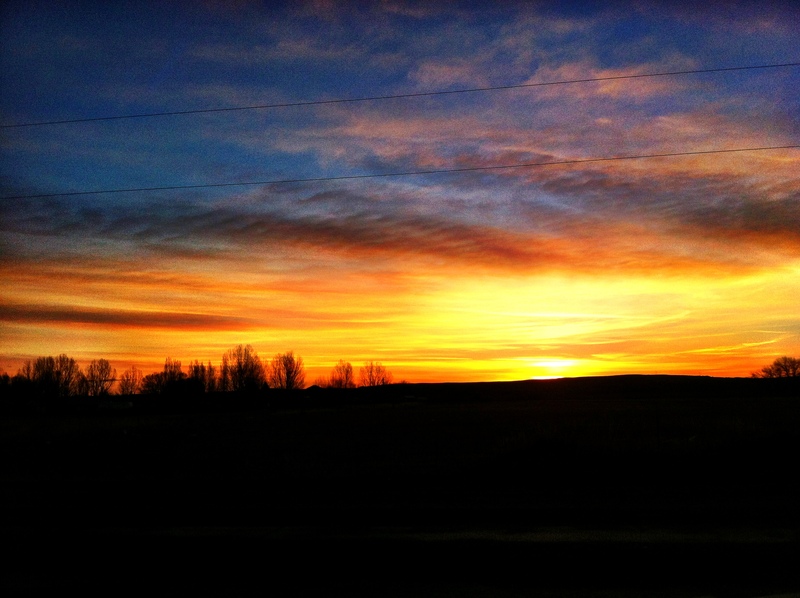 Getting to reflect–Getting to refuel. And getting to take off again soon. Posted in Adventure and tagged adventure, endings, fear, finale, landings, pilot, Risk, sadness, trip, winning. Bookmark the permalink. 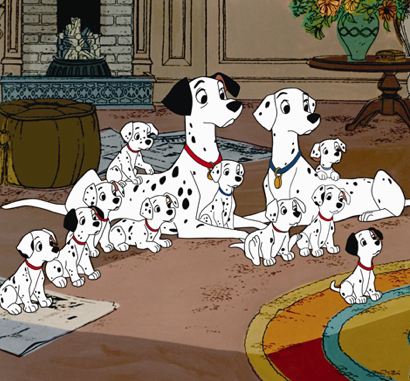 That’s more dogs than there have ever been in a Disney movie. 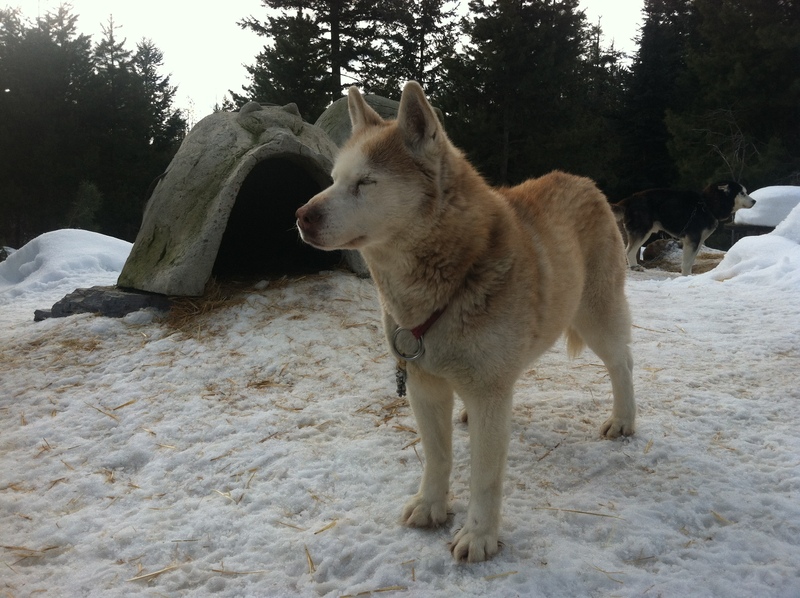 When we signed up for dog sledding, I had no idea what to expect–and a dog farm with 123 dogs never even crossed my mind. Sled with 12 dogs attached and a musher–maybe, but 123 dogs? No way. What an amazing surprise. 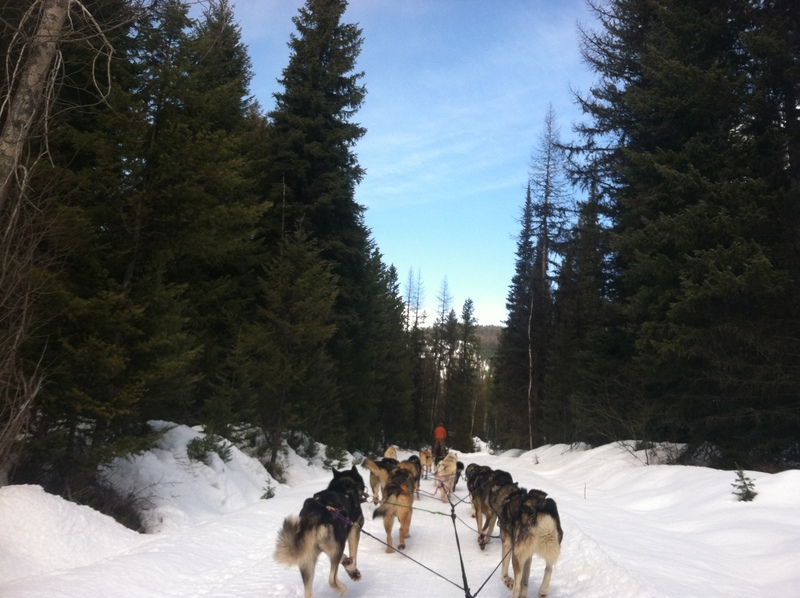 As we drove up a small road to Dog Sled Adventures Montana–just a few miles west of Glacier National Park, I saw a dog peek it’s heads out from behind some trees “There’s a dog!” I yelled. I turned to David–and I could just see his eyes light up, his heart bubbling with excitement. If the doors would have been unlocked, I am positive that he would have jumped out before the car had pulled all the way in. We were entering dog paradise. 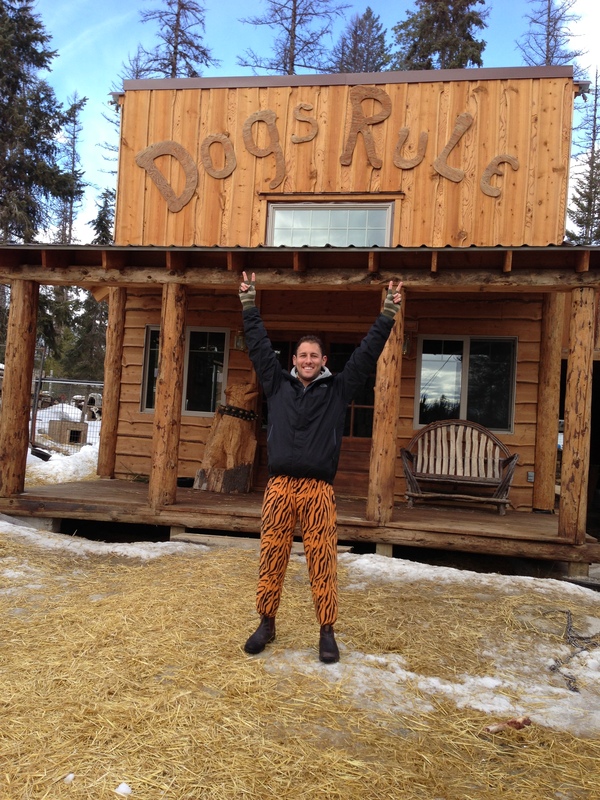 While making our final turn up the snowy driveway, Jeff, the owner, greeted us with a giant smile. I knew he must take the dogs out a lot –and that his business must be booming–by his wind burnt face which made his smile glow even more. 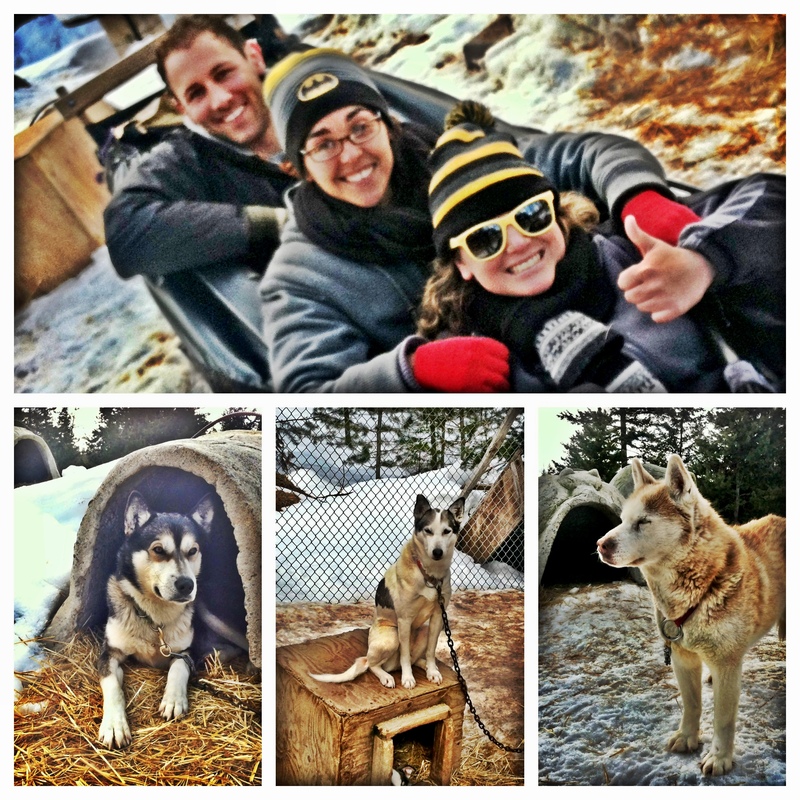 Before we even got on the sled, Jeff took us around the dog farm and introduced us to ALL of the dogs. Again–David’s face lit up–and even my soul danced a bit too. As we met more and more dogs, I began to get more and more excited–“These guys really want to do this!” I thought to myself as another dog snuggled up to my leg. 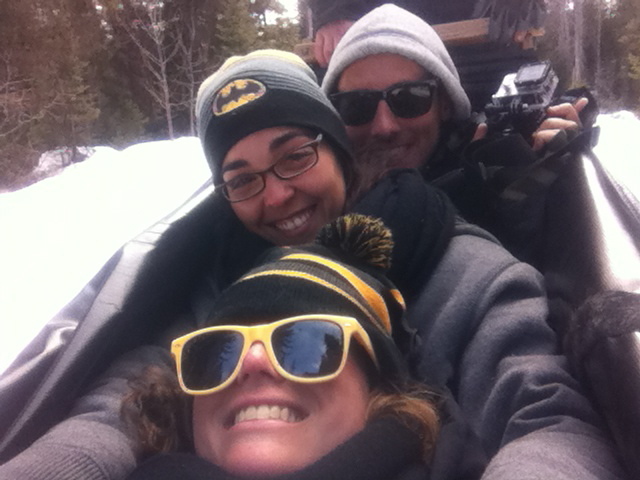 Not before long David, Kim and I were cozying up to one another in a three person sled. While we got ourselves in order, we could hear all the dogs howling. It felt like we were getting ready to take our marks and race–the dogs were lined up like fans at a sporting event. We watched as the rest of the dogs jumped up and down with as much as excitement as we felt in our now bundled bodies. “Woooo,” we all screeched out a bit, before hitting a few bumps on the first couple of turns. And he was right–sooner rather than later–we were smooth sailing around turns–up hills–down hills–and through the forest, stopping occasionally for a pee or poop break (for the dogs of course–even if sometimes they didn’t want to stop!). Once in a while we’d endure another bump–but more often than not we were giggling gratefully. “This is amazing,” I thought to myself. As we rode right along, I took in the views of the forest, the green that was still poking out from some of these Montana trees. I shielded my eyes from the sun as it ricocheted off the fluffy fresh flakes on the ground. And I took in the fresh smells of winter (even if they were intermingled with wiffs of dog soot). I felt Kims hands on my shoulders–and though I couldn’t see hers or David’s face for most of the ride, I could feel the energy of their smiles bouncing off the barks of the branches. After watching the videos back–I knew my feelings were right on. Each of us had smiles on that could have spread from one side of national forest we were riding through, to the other. The ride lasted approximately an hour–and as we approached the dog farm on our return, a chorus of dogs cheering us on, again, could be heard. 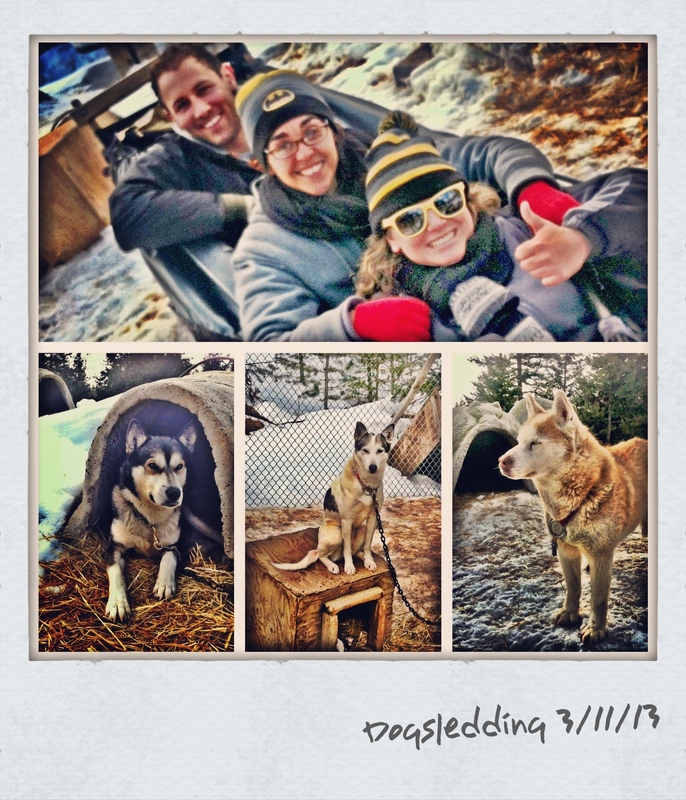 While we climbed out of the sled, the dogs continued to call to us. 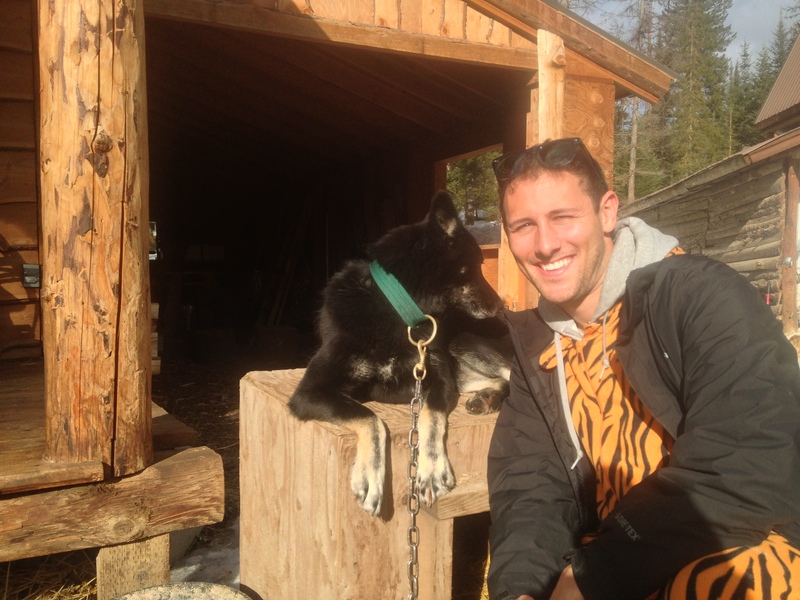 We exchanged high fives with our musher and then took another tour of the dog farm–making sure to give all the pups a friendly farewell. After saying our goodbyes, Jeff treated us to hot chocolate, cookies and conversation. I watched his eyes as he told stories about the dogs; as he relived his early sleigh rides; and as he spoke about the dogs as his family–and not just his company. I could see the passion growing as he continued to tell us truthful tales of the past. His eyes twinkled with each detail. He’s the kind of guy that you know wakes up before his alarm each day–and gets excited about it–the king of guy that you know–is genuinely happy. The kind of guy you are grateful to have met. The kind of guy that I know I am grateful to have met. 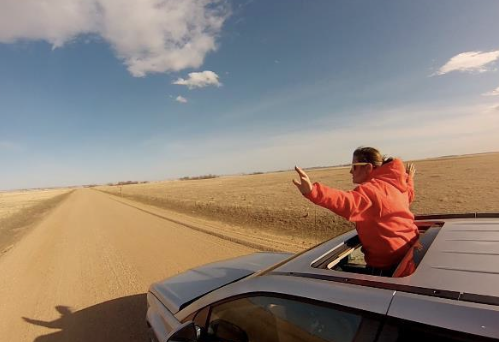 Posted in Adventure, road trip and tagged adventures, baha men, bumpy, conversation, dog sled, dog sled adventures montana, dog sledding, glacier national park, Life, man's best friend, montana, national forest, puppy love, ride along, Smooth, snow, stories, white fish, winning. Bookmark the permalink. I laugh along with my friend Naomi as we close out our curling lesson at the Ardsley Curling rink with the Long Island Curling team. I’ve watched curling in the Olympics several times, but I never understood how a sport–could be so intense with just a broom. But after one lesson, it became very clear that the sport of curling is full of strategy, skills, and teamwork. It is much more than just brushing the surface of the ice with the bristles of a broom. No–it’s about understanding how to throw a stone–flick the wrist–and lunge correctly. It’s about listening to your teammates as they yell sweep–or don’t sweep. It’s about paying attention to your skip and knowing where to place the stone. It’s about working together through communication. Like all sports: it’s about hard work, dedication, determination, and a will to want to get better. We move onto sweeping, which is fun and intense. It requires listening carefully to your teammates to know when to sweep and when not to. Sweeping, which I didn’t know is used to keep a stonet moving further—not to make it move faster. You sweep so that the friction makes a better area for the stone to move through. The Long Island Curling Club was nice enough to let us join a game, and Naomi and I were able to show off our newly found skills as we both placed a stone in the rings. At one point Matt and I have a small conversation about how this became his hobby. He said to me that he didn’t need to try everything–because he found his passion—curling. And I think that’s an important lesson in this year as well–it’s not always about trying something new–but just about finding something you love and sticking with it. Think about it–when was the last time you continued doing your FAVORITE thing in the world? Probably not as often as you’d like. I admire Matt for having that dedication in his life—especially to a sport that’s so difficult to find, right here in New York City. Posted in Fun and tagged Ardsley, Ardsley Curling Club, broom, Curling, friends, Ice, Long Island Curling Club, Olympics, Olympics 2016, Professional, Slippery, Sports, stone, sweeping, winning, Winter Olympics. Bookmark the permalink. There are few things that have excited me more in life than the moment I drove a car, by myself, for the very first time. I can remember the rain as it pattered on my windshield before my driver’s test, and how I worried that the conditions would make my test more difficult. And I can remember how I parallel parked perfectly, stopped smoothly at red lights, took turns cautiously—and was handed my driver’s license. Most of all, I can remember my smile as I dropped off my dad, before heading off to school—on my own—for the very first time. Prior to piloting a plane, driving a car was the most free I had ever felt. As a teenager, I drove my Saturn SL around Bethlehem, Pennsylvania blasting my music—and singing as loudly as possible. It was my own 90’s karaoke party every-time I turned the key, pulled out of my driveway, and headed to my destination. But there was something I never felt absolutely comfortable doing–and that was speeding—even if part of me always wished I could. I’m not sure if it was because one of my childhood best friend’s fathers sat me in front of a Nascar race every time I came over, or because I constantly felt a need to be moving at lightning speed—but a part of me had always wished I could drive a race car—just one time around a track. When I scheduled an indoor go kart race with a group of friends at the Grand Prix race track, I realized that this was a stepping stone toward that goal. As we loaded up our zip car to the race track, I could feel the excitement building–but not just mine–but our entire group’s. Everyone was ready to race, some maybe even more so than myself. As I pulled on my helmet, threw on the required neck brace, stepped into the small indie go kart, and buckled my seatbelt, I could feel my adrenaline preparing to join the race. That little car may have only had a speedometer of 40 mph, but as soon as I had the courage to really press the pedal, I felt as though I could move at light speed. And even as my friends passed me, and even though I came in last place–I felt a freedom that I had never felt behind the wheel of my Saturn—or later my Honda CRV. With each turn, I felt more in control and with each acceleration, I could feel my heart beating right along with the echo of the engine. As I completed one lap after another, I breathed into the adrenaline. Again, I was in dead last, but it still felt like a win. I looked out the window and smiled. Robert may not know it—but he just expressed the same feeling that I’ve felt every time I’ve turned the ignition and jump started every hobby or activity that I’ve tried this year—he’s just expressed the feeling that I am hoping to inspire others to feel when they take a dance class for the first time—or jump out of a plane for the first time—or pilot a plane for the first time—or race a go kart for the first time: that something special has just happened—because more than likely, it has. Thanks for a great day—David, Rick, Mercedes, David and Robert. Posted in Fun and tagged Adrenaline, Bethlehem, cars, friends, Go Kart Racing, go karts, Grand Prix, Hobby, Honda, indy, Jeff Gordon, Lapped, Laps, License, mario kart, Nascar, New Friends, New York City, NYC, Pennsylvania, Race Cars, Race Track, Rusty Wallace, Saturn, Speed Racing, Speeding, Sunday Funday, the hobby hoarder, Thumbs up, Track, Trophy, winning. Bookmark the permalink. Each year, on July 4th, there are parades all around America–and in those parades, stilt walkers come out by the dozens–dressed as Uncle Sam, Lady Liberty–and more. When I went to choose my hobby for the week of July 4th, I took a poll on Facebook and Twitter of what hobby I should do. 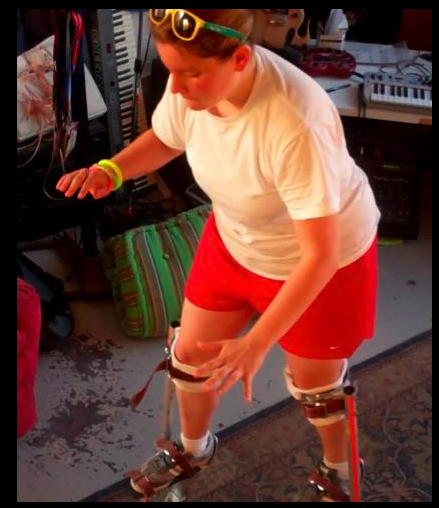 The majority voted that I should stilt walk–and so I did. It felt pretty nice to be tall. And all those who voted on THIS hobby! Posted in Adventure and tagged 4th of July, Barnum and Bailey, Bruise, Celebration, Circus, Declaration of Independence, Facebook, Falling, Hurting, July 4, Lady Liberty, Parades, Poll, Really Tall, Ringling Brothers, Statue of Liberty, Stilt, Stilt Dancing, Stilt Walking, Tall, twitter, Uncle Sam, winning. Bookmark the permalink. DISCLAIMER: As someone who is on a quest to become the professional amateur, by completing 52 hobbies in 52 weeks, I believe that it is absolutely beautiful to watch and support other people try new things and or complete their own challenges. Every now and then I will post videos and or stories from other amazing individuals who are taking advantage of all that life has to offer (cue cheesy music, and my big proud grin). Please contact me with your stories/ and or your hobbies @ thehobbyhoarder@gmail.com or tweet me @LibbySegal. 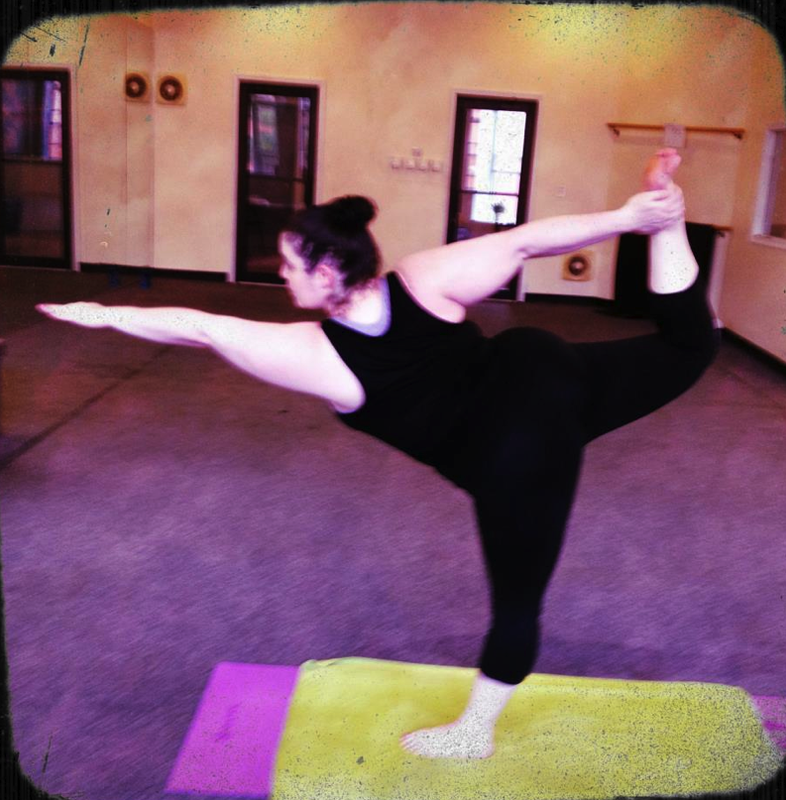 Rena Unger Completes 100 Bikram Yoga Classes in Less than 100 Days: That’s kind of a big deal! “Stretch more, Libby.” I can hear the echos of my field hockey trainers lecturing me on my lack of flexibility. Generally, when I am asked to stretch, I whine like a little girl. To use a throwback cliche–my muscles are tighter than spandex! This might explain why I have always been so intimidated by yoga classes. I’ve always felt like Gumby’s horse–rather than Gumby! But when I headed to Bikram Yoga East Harlem to support my good friend Rena Unger, as she completed her 100th Bikram class in less than 100 days, I was completely in awe of the workout–In fact, within moments, I sweated myself into a puddle Hot yoga is clearly no easy task, and I admire anyone who has had the courage to flex themselves into a pretzel in that type of heat–let alone 100 times in less than 100 days. What a challenge–what an accomplishment. And the truth is life should be about challenging yourself, aspiring to do BIG things, and inspiring others. On June 3, Rena did all 3. And I feel very fortunate to have been included on her journey. Here’s to 100 more. Posted in Guest Post and tagged accomplishment, Beauty, Bikram Yoga, challenge, East Harlem, flip camera, freedom, heat wave, hot yoga, inspiration, lifestyles, motivation, obstacles, peace, Rena unger, success, support, sweating to death, winning. Bookmark the permalink.